When it comes to your personal health, you are not alone! Take Meds Now is an advanced system that helps you leverage the everyday technology used to ensure that you take your medications as required. The problem we solve: Every year, there are over 600,000 emergency room visits and 125,000 deaths that are the result of improper prescription drug usage. Take Meds Now is an advanced system that helps you leverage the everyday technology you use to ensure that you take your medications exactly as directed. We provide customers with detailed notifications and a robust tracking system that offers you, your family and friends, and your physicians with peace of mind. Our system alerts you when it is time to take your medications, and includes an image of the medication, the dosage you need to take, any special instructions, and the reason you are taking the medication so you never forget or confuse another dose. You can then link your family, friends, caretakers, and physicians so your entire support network can assist you and monitor your patient adherence. About our solution: Take Meds Now has a proprietary closed loop system that connects patients and doctors like never before. Patients gain greater control of their personal healthcare and doctors gain an unparalleled view of patient adherence. We have completed focus groups, develop the prototype and now have just made Take Meds Now available to the consumer market. Our mobile app is available from Amazon, Google Play and Apple Store or via our website. TMN is supported and used by patients, doctors and caregivers today as an alerting, notification anbd tracking system. Our clients today include Independent Pharmacies, Senior Centers, Hospital and clinics. Future development will capture additional information that will be useda s part of our analytic services and provide clients with more functionality. Bio: I have the expertise, leadership, training, expertise and motivation necessary to successfully carry out the management of the proposed research project. I have a broad background in dealing with healthcare as well as being a caregiver. As lead Program/Project Management on several industry solutions, both commercial and government, I laid the groundwork and managed several large projects to successful completions. In addition, I successfully administered the projects (e.g. staffing, customer expectations, budgeting, training, implementation and on-going maintenance). Because of these previous experiences, I am aware of the importance of frequent communication among project members and of constructing a manageable and realistic research plan, timeline, and budget. Management of the proposed project builds logically on my prior work. During retirement 2008-present, I successfully spent time with students at the college and high-school level in classes as well as providing guidance and aiding them with their future careers. Upon returning to the field of managing this in-depth global solution through the requirements, research, development and implementation stages I will successfully support this project integrated in the healthcare industry. Biography: Jim is the Founder of the Prescription Notification Group. With over 35 years in the telecommunications and computing industry, Jim has held multiple executive positions at AT&T, NCR, and Verizon. He has won numerous awards for technical achievement and innovations including the AT&T Chairman’s award for excellence. Jim is also the former Director of Advanced Technologies at AT&T Labs. His responsibilities included AT&T initial mobility and digital imaging services. He served as AT&T ‘s technical interface to Federal agencies including working closely with AT&T Government relations and the United States Secretary of Health. Jim has also been honored to give the keynote address at the Healthy People conference with a view of new integrated tools that would impact United States Healthcare. After leaving AT&T, he served as a consultant to firms including Verizon, Comcast, Samsung and AT&T assisting them in launching their major new services such as Data Visualization, FiOS & Xfinity. Jim, has been a much sought-after speaker on Prescription Medication Safety and has appeared in several articles. Jim has always sought out solving problems and designing solutions that exceed the requirements outline by the customers. Our Take Meds Now software solution will save lives daily. Our goal is to offer software solutions that are easy to use and that will solve this epidemic prescription problem facing United States citizens. 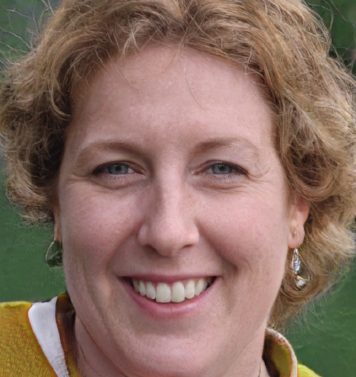 Biography: As a physician, I encounter a variety of complex medical conditions, and strive to consistently improve patient care. Early on in my training, I encountered several patients who had difficulty with medication compliance, and started investigating means of improving compliance. This search led to the development of TakeMedsNow, an innovative program designed to guide patients in better managing their health. After winning the Pitt Innovation Challenge with a team of dedicated scientists and technologists, we have rolled out development of this application to hospitals, pharmacies, and individual patients. With this grant, we would hope to further improve on development of this program as a means of improving patient’s health. Biography: Highly experienced technology, technology management, opportunity / needs identification and assessment, business management and analysis professional. I hold 57 U.S. patents in innovative technologies with the multimedia, messaging, web, data networking and voice communications space, having served as the New Service Concepts Director for AT&T Labs. Currently run a $38 million IT Consulting, Application Development company with 300 employees in the United States and 50 employees in the rest of the world. Have organized and run market research studies based around technology, have run studies focused on next generation technologies and their potential application, and run several technology trials for AT&T Labs. Additionally, served as a partner in a Distance Education and Training startup, where responsibilities focused on technology identification and development in addition to marketing strategy. Take Meds Now is a new tool for anyone that takes two or more medications a day. It is an alerting, notification and tracking service that takes the confusion or doubt if a medication was taken. It provides you with your own personal performance dashboard to see how well you are doing that can also digitally link you to a family member or physician. The mobility feature allows you to travel any where in the world and if you happen to get sick you can show the attending physician all the medications you are taking. This avoids getting some new prescription that may not react well with your existing medications. This is a highly secure software. The data never resides on the device so you don’t have to worry if you lose your phone or if it is stolen. Physicians also can look in to see how your doing at any time and send you messages. Take Meds Now consist of over 300 features which you told us you wanted in a new service. We built it and now we hope you join our family. As stated earlier, we lost 125,000 U.S. Citizens to accidental deaths associated with Prescription Medication annually. Each year the death rate goes up and the adherence rates go down. One way to combat the problem is to arm Consumers with a new sophisticated yet simple tool to combat both of these problems. The Prescription Notification Group was formed to take on a big issue that costing us citizens everyday that should not be dying. By improving the tools we also improve adherence rates and we will impact the accidental death rates from Prescription Medications. We first had to understand the reason why people were dying and what are the causes for all these deaths. We held focus groups around the country and find out the key reasons and design solutions with a personal dashboard that tracks performance. We also noted how important support from the doctor to family and friends was in the process. We created a digital process that would link everyone together in our closed loop solution. Close loop means that every action is tracked. We then created pilots with pharmacies to see if we can improve the adherence rates. On average we improved those rates by 5 days a month. This meant that a pharmacy with 500 active accounts could make another $56,000 in new revenue with the same base. So we wanted to understand why the rates improved. Clients dashboard used to make sure if the medication was taken. In many cases after a couple of weeks people got into a new behavioral habit so it became part of their personal process. Physicians could review dozens of patients in the matter of seconds. It also allowed them the opportunity to see how all their patients were doing with specific medications. By listening to the needs of both the patients and physicians we built a solution that is useful to all participants. It keeps patient mobile and even the physician has a better idea of what’s going on with a patient and their prescriptions. Any person in the United States that takes two or more medications will benefit from this personal health care system. It will also increase productivity of physicians, pharmacists and caregivers. Dozens of patients can be viewed in a matter a few seconds on their overall adherence performance. Prescription medication adherence is a critical component of medical care. Patients often forget to take their medication, which can lead to emergency room visits, accidental poisonings and death. Currently, delivery of medications and adherence to prescribed drugs is difficult to track. Doctors have no integrated service to monitor or intervene in medication adherence. Re-admittance is a big issue as well for hospitals . Last year fines reached almost $800 billion. Apart from individual patients, hospitals and clinics may be the most effected by the problem of patient adherence. The epidemic that is improper usage of prescription drugs sends hundreds of thousands of patients to the hospital… placing a tremendous strain on hospital resources. This is compounded by the steep fines a hospital or clinic may face if a patient is re-admitted within a month for the same ailment they were previously treated and released for. Not only is this a further strain on available resources, it is incredibly frustrating if the re-admittance is due to non-compliance with prescribed therapies. 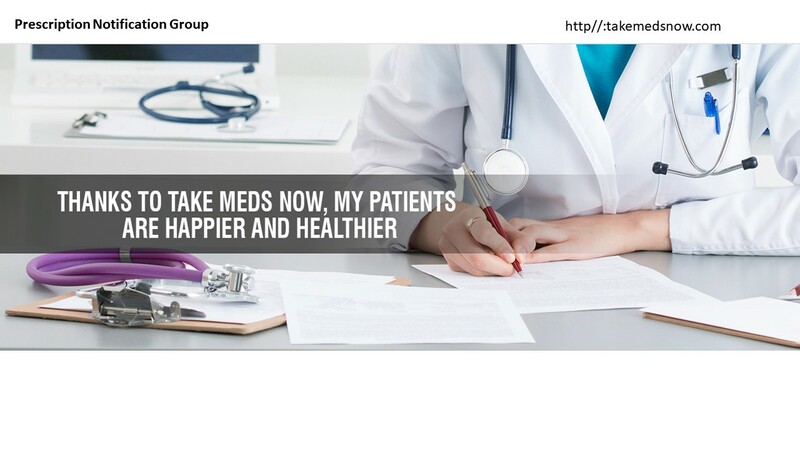 The Prescription Notification Group developed Take Meds Now to provide hospitals and clinics with a powerful system that reliably and accurately tracks and demonstrates actual patient adherence behaviors. Our cloud-based application sends automated medication reminders to patient computers and mobile devices (both iOS and Android), who must then manually confirm each dose as taken or the system records it as a miss. This creates a detailed patient adherence history that identifies improper usage and failure to comply with short and long-term prescription drug therapies. We are looking at partners that wish to digitize or provide an automated alerting, notification or tracking system. A system that can link to the existing hospitals system through a series of API's. We strongly believe in having a number of key partnerships in the various markets identified by using our service. Take Meds Now is so flexible that we are offering different solutions using the core technology. Our initial challenge is to develop a digital dashboard solution that would allow healthcare providers real-time data from the patients as it related to diabetes. Our system would track insulin and weight along with the time and provide that data to the physician in real-time. We believe that we need to create enhanced tools that are easy to use for the clients and beneficial to the physician as well to create effective individual-level risk assessments. We bring structure to the process that eliminates data transfer roadblocks between the patient, physician and hospital. Our digital, readily available solution can augment data that exists between organizations today. The messaging feature provides real time communication between the client and physician to increase that bond between patient and doctor. TMN is a new software tool that can provide individual medical data important to keep patients mobile and compliant in taking their medications? New Orleans is an international tourist location and with Take Meds Now you can travel the world over with confidence that you can take your medications and add medications if you get sick visiting a different city or foreign location. All new data can then be sent to your attending physician that a new prescription was added. Those that don’t have Smartphone’s would need to use a backend state of the art IVR system that could call individual on a designated land line and validate that they have take their medication. IVR confirmation would interface to our database and produce a checkmark that the medication was taken. The physician would see that patient’s dashboard and know the patient is compliant. This would allow us to offer the same high-tech complexity to those that don’t have a Smartphone device. Take Meds Now can be a carrier with you anywhere in the world. You are empowered with Take Meds Now to manage your Prescription Medication, but it also allows you to enter all your medical history data, vitamins and supplements. Depending upon the hospital system our product was built to interface with the most common architectures and hospital processes such as EPIC. Security is a key feature since your data sits on a virtual cloud no one can get access to the data. So, if you use a Smartphone device and it is stolen or lost no personal medical data sits on the device and is unavailable to anyone but you. Take Meds Now also will allow you to link to multiple physicians beyond the primary care doctor. This allows all your doctors to see what medications are being given to you for what ailment. This should reduce conflicted positions, but it also documents the data to protect your personal health. Take Meds Now is a basic tool that provides for alerting, notification and tracking of all your medications. Our goal is to eventually offer this low-cost solution free through Pharmacies. We need customers and clients to demonstrate that adherence rates and preventive care rates go in positive directions via the use of Take Meds Now. The cost would be picked up by the increase revenue associated with increasing adherence. Also, we believe prices would come down since 50% of Prescription Medications are not taken and in some states 50% of those are taken improperly. We believe through AI and use with a system like take Meds Now, we can create a WIN for the industry by increasing adherence, a win for physicians and hospitals by offering better quality control and a WIN for the patient by having lower costs prescriptions, lower insurance rates for those with pre-conditions and “peace of mind” using Take Meds Now to track their personal results. Take Meds Now core technology is flexible. It is network based and supports patients, doctors, hospitals and care givers in every location where the internet exists. It is a tool for the patient, for all doctors, not only those in a specified hospital system. As we grow and get customers in various areas we are committed to add staff to those locations for support and training. We have partnered with ASTIR IT for development. ASTIR IT has a staff of 300 in different locations throughout the US. Our current team is located in NJ, Pa, NC,FL and NV. Our team building plan can incorporate staff in other areas i.e. New Orleans for additional support. System design and process management designs are protected. Adherence of Prescription medication is a big problem in the United States . AARP November 2018 Issue 50% compliance rates. We conducted our own study and we show that we can significantly increase earnings of independent pharmacies that used take meds now. This is an new tool in people's personal arsonal to stay mobile and healthy. We are HIPPA compliant and at this time see no need to be FDA complient. Dr. James S Kaus will be our lead investigator. He will assist in organizing focus groups with Health care professionals. The team will establish a set of questions based upon the information required by a physician from their specific field of expertise. The intent is to capture key data that will be useful to the physician, this data can be tracked daily and reviewed as often as the physician wants on-demand. We will test special alerting capabilities that automatically sends notices to the patient and physician. We will review imaging-based technologies to see how to simplify the process. These comments will then be turned into requirements that will impact mobile and computing devices and become part of the Take Meds Now - Segment. We will test that all the linkages work properly and that we begin to develop an imaging database of medications associated with that discipline. In parallel, we will hold focus groups with U.S Citizens around the country to get feedback on select features and ease of use. Our goal is that a single swipe or click on a mobile device, will be the only input required to set up an array of reports and data useful to the Healthcare industry. Please support our team: "The Prescription Notification Group" is a group of scientists and industry leaders that have come together to design a digital and mobile based personal health care management system that will empower patients to take their medications as prescribed and to reduce 65,000 accidental deaths 600,000 annual trips to the emergency room. The technology will be used by patients and the professional health care specialists using existing mobile services, linked to an alerting, notification and tracking system that includes an image of the medication to be taken. Designed to be used by anyone who takes more than 2 medications a day. It requires only a single click or swipe on the alert that you have taken your medication properly. This data is linked back to the physician, pharmacists, caregiver and even a family member to see in real-time if the patient is taking their medication. If not, an automatic warning alert could be sent to both patient and physician that the patient wasn’t adhering to the medication properly. Proposed in this project is research to extend specific software requirements from physicians to offer a new set of products designed to enhance medication adherence. Specifically, we plan to gain an understanding of the methods and mechanisms by which physicians and other medical providers would be able to use real-time medication compliance data to intervene and improve medication compliance. Given the medical complications associated with diabetes, we are planning a focused assessment of medication compliance issues regarding specific treatment processes. In addition, we will explore further means of reducing readmission rates which occur frequently in congestive heart failure, and COPD patients, we are planning on addressing these and other chronic medical conditions to assess response to interventions. This Integration of technologies from multiple industries to create a new solution that is high risk will deliver high reward for the medical industry. This game changing technology will impact the health of every American. Specifically, working with integrating software application with a pill packaging delivery system will offer the world’s first medication adherence platform. This will improve real-time communications between the physician and patient and to share medical data on-line with physicians as well as others. Our approach supports the AHA requirements of digital linking the physician to patients by 2020. Physicians will be able to take corrective actions sooner, rather than later. 01/16/2019 - Followed the project.